Cultivated beauty and taste is what the Lyon dining table and chairs will bring forth to your social gathering or elegant events. 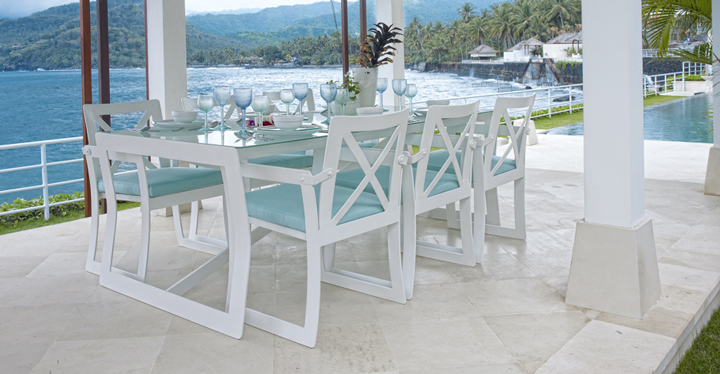 Skyline outdoor furniture is of a premium quality, highly resistant, commercial grade construction, ideal for Hotels, Restaurants and the discerning consumer for residential use. 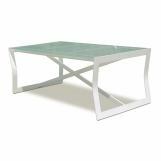 This dazzling ensemble is an all white solid aluminum with fine, slender arms and legs. 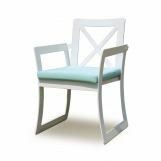 The rectangular dining table features a Smoke colored glass top and dining chairs with beautiful cushions in the standard Glacier 5428 Sunbrella ® fabric. 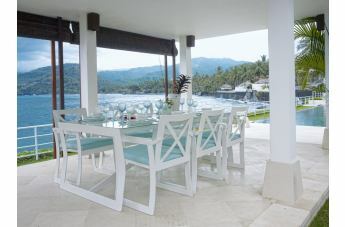 This set includes one table, six chairs with cushions.